Access to Early Childhood Development (ECD) programs has expanded globally, however in low- and middle income countries, children from disadvantaged backgrounds are often left out, and programs are often of poor quality. Despite a strong case for investing in young children, current levels of financing for ECD fall far short of those necessary to provide access to high-quality services for all children from birth. The adoption of the Sustainable Development Goals and specifically target 4.2 confirms the importance of ECD within the global policy agenda, yet estimates suggest annual costs for one year of high-quality pre-primary education alone in low and lower-middle income countries will need to increase nearly sevenfold compared to current cost estimates. This estimate does not reflect additional resources needed for a range of other ECD services that begin at birth. Most research on financing ECD services has been conducted in high-income countries, with limited relevance for more resource-constrained contexts. 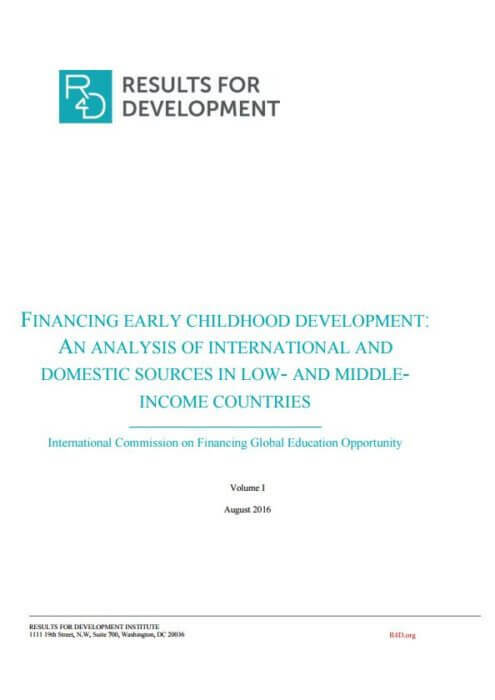 This background paper prepared for the Education Commission fills a critical gap in the global knowledge base by reviewing and analyzing the state of financing for ECD, with a focus on low- and middle-income countries. The study analyzes the role of international, national, and private actors in financing ECD; the principal financial barriers to promoting access, quality, efficiency, and effectiveness in delivering ECD; and potential solutions to increase and improve the effectiveness of financing, while addressing issues of equity. Support the generation of contextually relevant evidence that can influence advocacy efforts to increase domestic financing and quality improvements.